I am a total sucker for a delicious dip. Something about gooey deliciousness just wins over my heart and stomach! Today I'm sharing a bunch of my favorites with you. 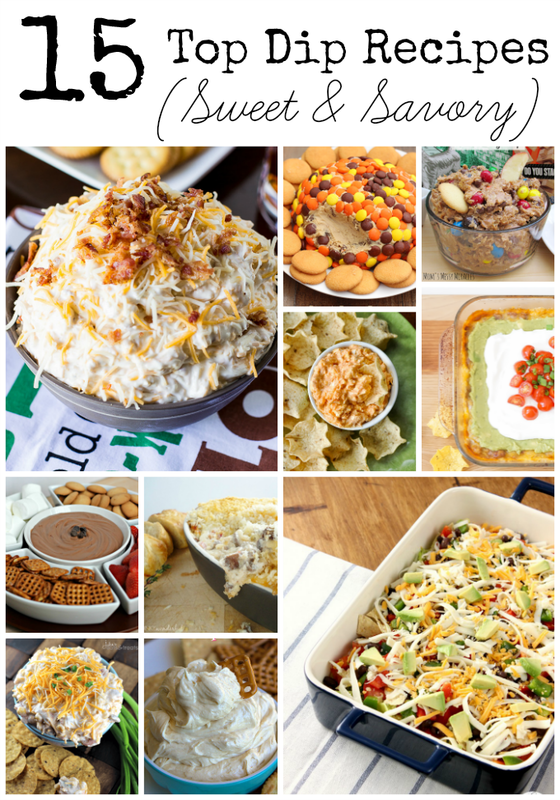 Whether you like sweet dips or savory dips, I guarantee there is something here for everyone. Except people who like to eat healthy. You might want to skip this post. Or just drool sadly over the pictures. 1. Classic Slow Cooker Spinach and Artichoke Dip by Damn Delicious 2. Cheesy Bacon Ranch Dip from Deliciously Sprinkled 3. Stuffed Mushroom Cheesy Dip from Wonky Wonderful 4. Cheesy Corn Dip from Julie's Eats and Treats 5. Lightened up Taco Dip from A Kitchen Addiction 6. Roasted Sweet Pepper Dip from Keep it Simple Sweetie 7. Baked Chili Dip from Simply Designing 8. 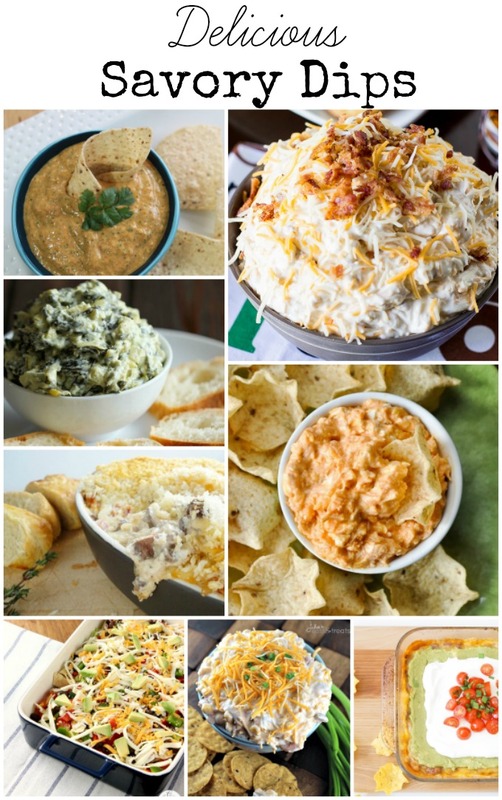 Buffalo Chicken Dip from Bombshell Bling Now for the really good stuff- my favorite sweet dips! 1. 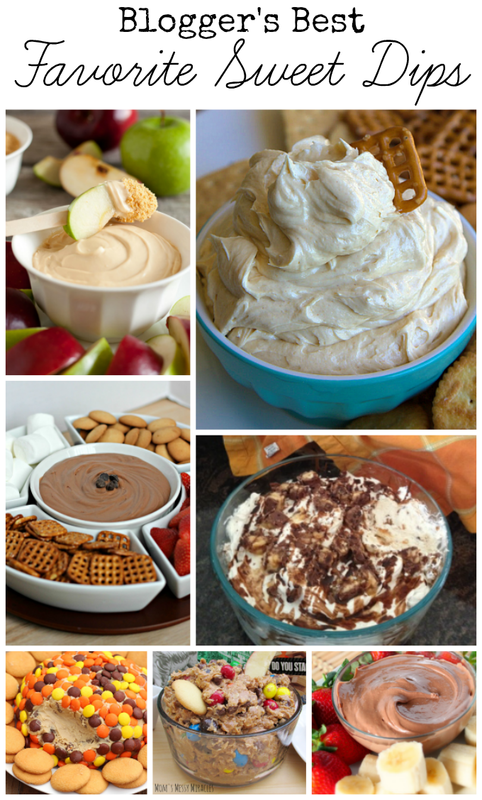 Snickers Dip from Food.com 2. Creamy Nutella Dip from Six Sisters Stuff 3. Monster Cookie Dough Dip from Mom's Messy Miracles 4. Reese's Peanut Butter Cookie Dough Cheese Ball from What's Cooking Love 5. Fluffernutter Dip from This Silly Girl's Life 6. Caramel Apple Cheescake Dip from Cooking Classy 7. Brownie Batter Dip from Stick a Fork In It Bring one (or more) of these dips to your next party and you're guaranteed to be everyone's favorite person. Enjoy! P.S. Want to be featured in a roundup? Link up to The Handmade Hangout every Thursday at 3pm ET and link back to us for a chance to be featured on one of 8 blogs! See you there tomorrow!